my friends don and john have an annual cinco de mayo celebration that they like to call ‘cinco de drinko’ at a restaurant in burbank called mucho mas. it was the first time that i was able to make the festivities, because in years past i have always been working. the inaugural meeting occurred on may 5th, 2005 starting at 5:55p with 5 friends, and don said he had 5 margaritas. well the gathering has grown extensively ever since, including the amount of margaritas, and there are hopes of a webcast next year. being that the event started at an hour that no one in their right mind wants to get on the freeways in the los angeles area, coupled with the fact that i would indeed be imbibing myself, i decided to hop on my trusty steed, head to the subway, and skip the headache of friday traffic, a dui, or encountering someone not responsible with their drinking. when i got out of the (un-airconditioned) subway at the north hollywood station (quite a climb of stairs with not such a light bike), i had a lovely 10 minute ride down the chandler bikeway. needless to say when i arrived to my destination, i was fairly parched. within moments john poured me a refreshing margarita on the rocks with salt, and even though i am not a huge margarita connoisseur (i personally like them a bit more tart and not so sweet) it was the perfect way to start really nice evening with friends old and new. after a couple of those, i decided i should eat something, especially if i wanted to able to bike back to the subway upright later that night. i ordered the carnitas tacos, which is regular go-to for me at a mexican restaurant. 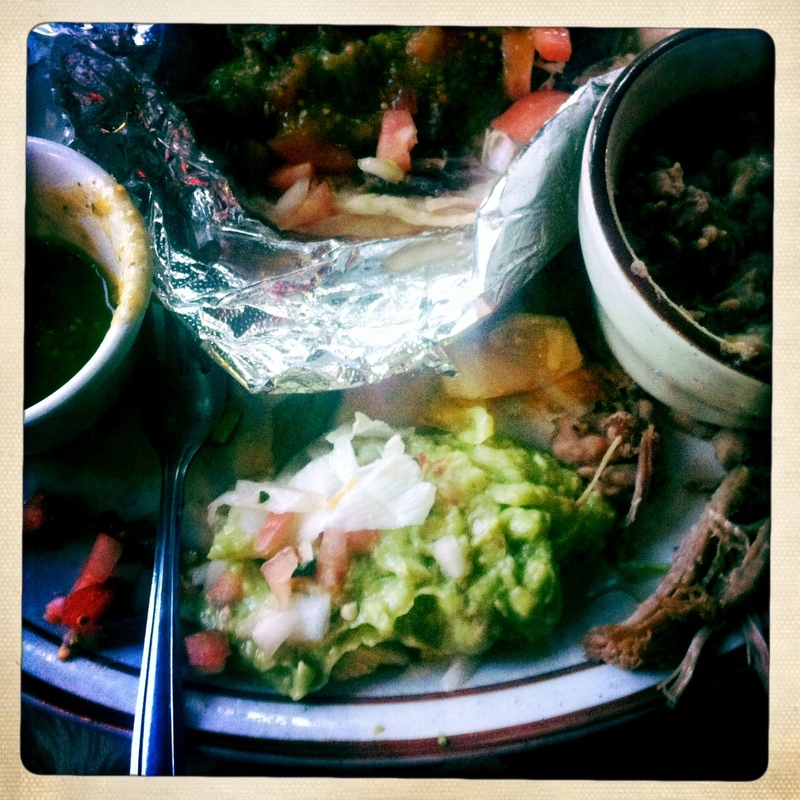 my feeling is that it is really hard to screw up carnitas, and if they do, it’s a deal breaker. the pork was flavorful and juicy, and not too fatty, which is all i ask for in carnitas really. i could have used a little bit more of the browned crispy outside of the meat, but i think that is more luck of what the tongs put in your tortilla than anything. it was served with a side of beans and cheese, guacamole, salsa fresca, and a spicy salsa. the salsa fresca was mostly tomato, and not enough onion, cilantro and jalapeño, but the spicy salsa had a good kick to make up for it. i was just thankful that john’s adorable 3 year old daughter april was there to help me eat it, because it was a lot of food. ultimately it did it’s job and filled my belly, so the constant refills of margaritas had something to land on over then next few hours. i met some new peeps, and caught up with some i haven’t seen in years, which is always a really nice way to spend a night. i could have stayed much longer, but knowing i still had to get myself back downtown at a decent hour, i took off on my bike and headed toward the subway. 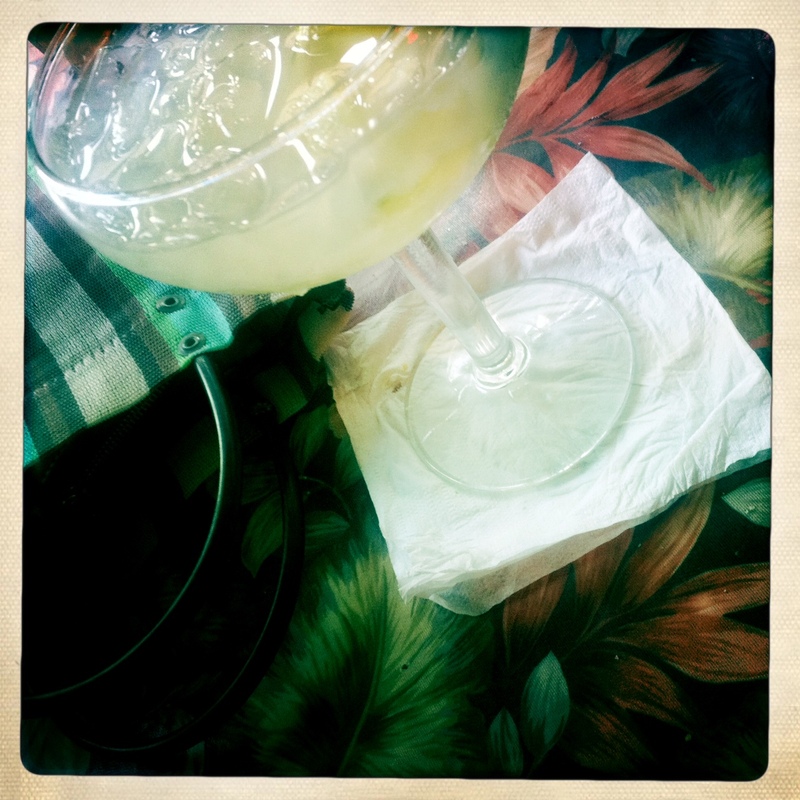 i was happy knowing i’d be back next year: saturday, may 5th, 2012 at 5:55pm, with at least 5 friends, number of margaritas tbd. What fun! Impressed that you could still bike. i’m not sure that they were that strong, plus i stretched them out over the hours i was there, so i was feeling fine when i left, but certainly glad i wasn’t operating a motorized vehicle. After all these years of inviting you, it was so lovely to see you finally able to make it out. A wonderful time was definitely had by all. Next year promises to be even bigger as the 8th annual cinch de drinko margaritapalooza extravaganza falls on a saturday. Hope to see you there.